One of the greatest means of salvation and one of the surest signs of predestination, is unquestionably, the devotion to the Most Blessed Virgin. All the holy doctors of the Church are unanimous in saying with St. Alphonsus of Liguori: “A devout servant of Mary shall never perish.” The chief thing is to persevere faithfully till death in this devotion. 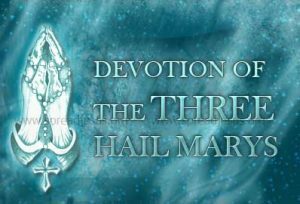 Numerous examples show how agreeable the three Hail Mary’s Devotion is to the Divine Mother and what special graces it draws, during life and at the hour of death, on those who never omit it for a single day. This practice was revealed to St. Melchtilde (13th century) while she was beseeching Our Blessed Mother to assist her in her hour of death. Our Lady appeared to her and said: “I will, certainly. But I also want you to say three special Hail Mary’s to me every day. “The first will be in honor of God the Father, Whose omnipotence raised my soul so high above every other creature that after God I have the greatest power in heaven and on earth. In the hour of your death I will use that power of God the Father to keep any hostile power far from you. St. Leonard of Port Maurice, the celebrated missionary, had the Three Hail Mary’s recited morning and evening in honor of Mary Immaculate, to obtain the grace of avoiding all mortal sins during the day or night; moreover he promised in a special manner eternal salvation to all those who proved constantly faithful to this practice. He gave this devotion of Three Hail Mary’s as a penance in the confessional, especially for those who were struggling with sins of impurity. One night they were at the house of an evil woman; but one of the two, who was named Richard, stayed only a short time and then returned home. While he was preparing to go to bed, he remembered that he had not yet said the few Hail Mary’s that were his daily practice. He was very tired and half inclined to omit them; nevertheless, he forced himself through the routine, saying the words half asleep and with no particular devotion. Then he laid down and fell asleep. Our Lady, clement and merciful to all who have recourse to her Suddenly he was wakened by a violent knocking at the door. The door was closed, but the figure of a young man, hideously deformed, passed through it and stood before him. “Who are you?” Richard cried. “You do not know me?” asked the other. “Alas, unhappy creature that I am,” said his companion, “I am damned! When I was leaving that house of sin, a devil came and strangled me. My body lies in the street; my soul is in Hell. “And know this — the same fate awaited you, except that the Blessed Virgin spared you for that little act of homage of the Hail Mary’s. If you are not a fool, profit by this warning which the Mother of God has sent.” He then opened his mantle, showing the flames and serpents by which he was tormented, and disappeared. Breaking into a flood of sobs and tears, Richard went down on his knees to give thanks to Mary his protector. Then as he pondered how to change his life he heard the bell of the Franciscan monastery ringing for matins. “It is there,” he said, “that God calls me to do penance.” He went immediately to the monastery and asked the Fathers to admit him. Since they knew his wicked life, they were hardly willing to do so. But sobbing bitterly, he told them all that had happened. And when two Fathers had been sent to the street and had found the strangled body, which was charred and blackened, they admitted him. From that time on he led an exemplary life and at length went to preach the Gospel in India, and thence to Japan. There he had the happiness of giving his life for Jesus Christ, being burnt alive for the faith at Nagasaki on September 10, 1622. In the city of Naples in the early fifteenth century, a certain distinguished gentleman began to entertain the modern notions of the day critical of the Catholic Church. Soon he had abandoned the practice of the Faith and was causing great scandal among the faithful for his open ridicule of those who frequented the Sacraments and practiced popular pious devotions. Nonetheless, his affairs prospered, as so often happens among the men of this world. He became famous for the marvelous feasts and parties that he frequently hosted in his palatial residence. Of particular interest to all was an unusual little steward who would serve the astonished guests. Dressed in a charming red velvet and gold braid vest and hat, serving plates with perfect propriety, and then offering charming displays of acrobatics, was none other than a grinning little monkey! It was the talk of the city, and many the ladies who pleaded with their husbands to accept the invitations to a feast put on by the avowed agnostic so that they might witness the marvelous sight! Before too long, the gossip about the strange steward reached the ears of a parish priest renowned for his holiness and virtue. But instead of dismissing the talk or issuing warning about attending the parties of one so opposed to the Holy Church, the priest asked to receive an invitation to the next gala event to see for himself the truth of this talk. The host at first desisted – none of those foolish, sour-faced clerics would set foot on his premises! But in the end, his spirit of pride conquered: he wanted to flaunt the feats and antics of his devoted little four-footed servant to the credulous priest. The invitation was issued. The evening arrived, and the priest rang at the bronze gates of the palace some time after the festivities had begun. “A priest begging leave to enter my hall,” his jovial host remarked at his entrance. “Will wonders never cease! But, indeed, this is a house of wonders.” “Yes, so I have heard,” the priest calmly replied. “And truly I must say I am interested to see this amazing sight of a monkey who serves a man.” The host immediately rang his special silver bell that called his peculiar steward to his presence. But the monkey, who only moments before had been charming a group of ladies with his antics, did not appear. The baffled host shook his head in amazement. This was the first time it had failed to respond to his call. The priest insisted: he had come expressly to see this strange sight and would not be deprived of the pleasure. The host called again. No reply. The monkey seemed to have disappeared. A search of the house was made, and finally the creature was discovered, shaking in his velvet suit under the bed of the host. It was dragged out from under the bed, the little creature trembling and struggling to escape the presence of the priest. “Now,” the priest demanded, “I command you in the name of the Almighty God, Three in One, to tell your master who you are and what is your purpose in this house.” Forced to obey, the furious, still trembling monkey spat out these words to his shocked master: “I am no ordinary beast. I am a demon from hell who has taken on the form of a monkey who attends to your every bid and call. And so I do, but I await under your bed every night for the first night that you might leave off that abominable custom taught to you by your mother of saying three Hail Mary’s before you retire. For then, and only then, do I have permission to strangle you in your sleep and drag your soul to the eternal fires.” With these words spoken, the writhing monkey disappeared. The arrogance and mocking manner of the host faded with the wretched creature. Ashen faced and shaken, he turned to the priest. “Ah, my fortunate man,” the holy man said. “For fortunate indeed you have been to have retained this small devotion to the Mother of Mercies, who never abandons even the most wretched who have recourse to her.” He heard the confession of the man, who became a model of faith in the city and was especially renowned for his tender devotion to the Virgin Mary. This entry was posted in Devotions and tagged Apparitions, contemplation, meditation, miracles, prayer, Rosary. Bookmark the permalink. thank you for giving me the devotion to our Blessed Mother Mary.